Robin and I don’t go out to eat very often. Since we cook fairly well, and always have amazing wine on hand, why settle for something subpar? And, when we do go out to eat, it’s usually the same two or three places with unique menus, and a great wine list, or a corkage fee. However, after a fairly favorable meeting that will likely lead to a new job after my three month lay-off, we decided to go out. 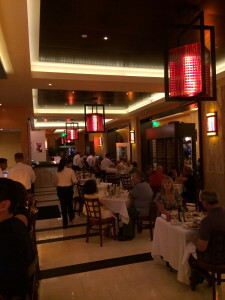 We stopped into the newly renovated Il Bellagio restaurant, which reopened a week ago in City Place here in West Palm Beach. The place was packed, so we decided to give it a shot. The renovations were nicely done. Frankly, the place looked exponentially better than it had our last visit in November 2012. Oh, and thank you Foursquare, for keeping track of that information. The new bar looked great, a funky design and well lit, with two new wine coolers designed to keep the wine at (we hope) the proper temperature. However, that is where my excitement about wine stopped. Perusing the wine list, and specifically the by-the-glass list, I was so disheartened, I could have wept. In a restaurant that offers a price point of $30 per dish, you would think they could up their game just a little, and not offer low quality wines like Cavit by the glass. Now, listen, there’s no doubt that Cavit has a market. There’s a big market for budget focused wines. And, some of them aren’t half bad. Robin drinks Barefoot Chardonnay as our “house wine”, and not just because I think winemaker Jennifer Wall is awesome. However, I find something insulting about restaurants pouring a $5.99 grocery store bottle for $7 or so a glass when their cuisine goes for $30 a plate. I would think that any restaurant that wants to provide an exquisite dining experience would offer wines equal to the quality of food they serve. I know there are monetary factors involved, but I can’t believe it’s impossible to find a $7 or $8 by-the-glass wine that isn’t an insult to a customer’s sense of taste. As a restaurant, you are the sum of your parts. If your food and wait staff ROCK, but anything you try to drink with your food is terrible, you’re not doomed, but you’re in pretty poor shape. Try to offer your guests the best experience possible, and that includes what they drink with their meals. Now, Il Bellagio has a half decent selection of by the bottle wines. There were at least two under $50 that were decent. However, we weren’t up for two glasses each, so that didn’t work for us. Our meals themselves were fine. I just wish the poor wine selection didn’t leave such a bad taste in my mouth. How about the wine list at your favorite restaurant? Are the by the glass options good? Or do you just love the food so much, you choke it down without wine?